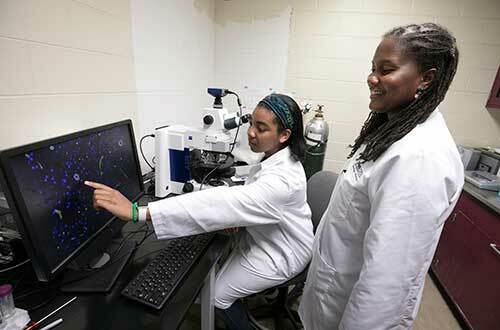 Pre-veterinary student Makayla Wiley (seated) from Alcorn State University in Lorman, Miss., uses a fluorescence microscope as she works with her PVM faculty mentor, Dr. Tiffany Lyle, assistant professor of veterinary anatomic pathology, on her summer research project involving microscopic analysis of the blood-brain barrier. A total of 18 DVM and pre-veterinary students are getting first-hand experience in the realm of scientific discovery this summer by participating in Purdue Veterinary Medicine's 2017 Veterinary Scholars Summer Research Program. The program partners students with faculty members on the basis of their mutual areas of interest for 11 weeks of focused research, seminars, field trips, and symposiums. Started by the late Dr. John Van Vleet, former associate dean for academic affairs, in 1991, the program has been held annually ever since. This year's participants include 12 Purdue DVM students and six pre-veterinary students from Purdue, Lawrence University, Howard University, Alcorn State, and Wheaton College. Dr. Harm HogenEsch, Purdue Veterinary Medicine associate dean for research and professor of immunopathology, and Dr. Eli Asem, professor of physiology, organize the Summer Research Program, putting together the teams of students and faculty mentors based on shared research interests. Dr. HogenEsch said the goal of the program is to make DVM and undergraduate students aware of the opportunities to pursue research and research-related careers, and to increase the number of students that are interested in advanced training following graduation. "Research is the foundation of veterinary and human medicine, and veterinarians make important contributions to biomedical research in universities; in government agencies, such as the NIH, USDA, and CDC; and in industry," he explained. Additionally, Dr. HogenEsch said the program also includes undergraduate students interested in veterinary medicine, who come from all over the US. "The goal of this part of the program is to recruit talented students with an interest in research into our DVM program," he said. The veterinary student program is funded jointly through Boehringer-Ingelheim and the Purdue University College of Veterinary Medicine, with additional support from the Morris Animal Foundation, and includes an opportunity for the DVM students to travel to the Merial NIH National Veterinary Scholars Symposium. Undergraduate study opportunities are funded through the College of Veterinary Medicine. As part of the program, the students will spend a day at Covance Laboratories in Greenfield, Ind., August 1. They also participate in extracurricular activities such as a veterinary scholars' picnic. Additionally, the students attended a combined Veterinary Scholars Symposium with University of Illinois Summer Research Program students at Lynn Hall on June 27. The program will conclude Wednesday, August 2, when the Summer Research Fellows share their findings with PVM faculty and staff at a research poster presentation in Lynn Hall, Rooms G119/155 from noon to 1:30 p.m., before the DVM students continue on to the national Merial-NIH Veterinary Scholars Symposium in Washington, D.C., August 3-5. Congratulations to the following 2017 Summer Research Program participants! 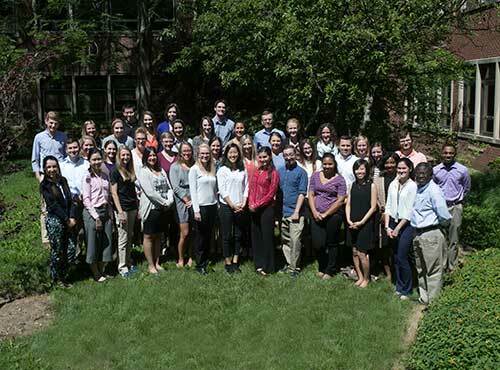 DVM and pre-veterinary students participating in Purdue Veterinary Medicine's Summer Research Program join their counterparts from the University of Illinois Summer Research Program for a combined Veterinary Scholars Symposium held at Lynn Hall, Tuesday, June 27. Between the two universities, a total of about 40 students participated.